Magda M. Olchawska is a writer & award winning filmmaker. She was born at the end of a very long & cold winter in Wroclaw, Poland. When she was born, Poland was still a communist country and a pretty scary place to grow up. Oh, and grey and ominous for a kid. After graduating from high school Magda decided to follow her dreams of becoming a film-maker and moved to London. While in London she joined an acting school, later followed by film school. Magda has always been into making up stories, and often, living in her imaginary world with imaginary friends, where nothing was as scary as the outside world. She wrote a lot of short stories & loved poetry while at school. But on one particularly low day she destroyed all of her work. Following her act of self-destruction Magda didn't write for few years. Until one day she woke up on a very cold and foggy morning and started writing scripts. Early inspiration in her life came from Hans Christian Andersen & the brothers Grimm's stories as well as old 40's & 50's movies. Later in life she was to be inspired by Kafka, Dostoyevsky, Camus, Saint-Exupery and a lot of children's authors. Most of Olchawska's scripts have been turned into movies and one of her feature film scripts "Two People" is in pre-production, ready to commence shooting next year. Magda's writing has evolved since giving birth to her son a few years ago and she has decided to venture into much brighter & lighter tones. 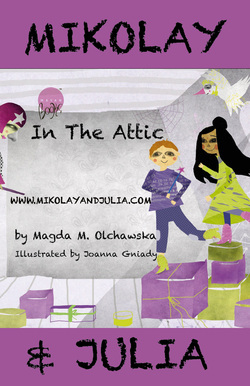 Mikolay and Julia, a pair of five year old wizards are searching the attic for a wand. Mikolay explores the attic on regular basis and is always able to find the most unusual magical objects. This time they are looking for a wand for Julia. Julia doesn’t have one yet because she is too young. However, breaking the rules is Mikolay’s specialty and he often gets Julia and himself in troubles because of that. Out of blue Mikolay notices a very tall Shadow, which he decides to follow despite Julia’s reservation. The Shadow leads the two of them to a very scary place called “Circus” where they discover cages with locked up children and animals. In no time at all Julia is organizing the rescue mission, which unfortunately doesn’t run as smoothly as she would like.